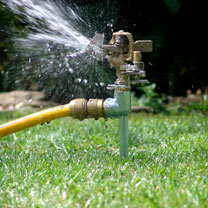 This metal spike pulsating sprinkler ensures that your lawn and plants are watered easily and effectively. It has a zinc sprinkler head, as well as brass hose connector attachment for a half inch hose. It has adjustable spray pattern and variable coverage options, which has a range of up to 15 metres in diameter under normal water pressure.